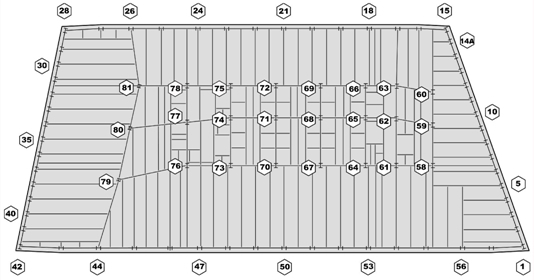 Diagram 1-Typical WTC 7 floor showing locations of columns (numbered). The buckling of Column 79 was the initiating event that led to the collapse of WTC 7. The buckling resulted from fire-induced damage to floors around column 79, failure of the girder between Columns 79 and 44, and cascading floor failures. Progressive collapse is defined as the spread of local damage from a single initiating event, from structural element to element, eventually resulting in the collapse of an entire structure or a disproportionately large part of it. The failure of WTC 7 was an example of a fire-induced progressive collapse. Progressive collapse did NOT occur in the WTC towers, for two reasons. First, the collapse of each tower was not triggered by a local damage or a single initiating event. Second, the structures were able to redistribute loads from the impact and fire-damaged structural components and subsystems to undamaged components and to keep the building standing until a sudden, global collapse occurred. Had a hat truss that connected the core columns to the exterior frame not been installed to support a TV antenna atop each WTC tower after the structure had been fully designed, it is likely that the core of the WTC towers would have collapsed sooner, triggering a global collapse. Such a collapse would have some features similar to that of a progressive collapse. How did the collapse of WTC 7 differ from the collapses of WTC 1 and WTC 2? WTC 7 was unlike the WTC towers in many respects. WTC 7 was a more typical tall building in the design of its structural system. It was not struck by an aircraft. The collapse of WTC 7 was caused by a single initiating event-the failure of a northeast building column brought on by fire-induced damage to the adjacent flooring system and connections-which stands in contrast to the WTC 1 and WTC 2 failures, which were brought on by multiple factors, including structural damage caused by the aircraft impact, extensive dislodgement of the sprayed fire-resistive materials or fireproofing in the impacted region, and a weakening of the steel structures created by the fires. The fires in WTC 7 were quite different from the fires in the WTC towers. Since WTC 7 was not doused with thousands of gallons of jet fuel, large areas of any floor were not ignited simultaneously as they were in the WTC towers. Instead, separate fires in WTC 7 broke out on different floors, most notably on Floors 7 to 9 and 11 to 13. The WTC 7 fires were similar to building contents fires that have occurred in several tall buildings where the automatic sprinklers did not function or were not present. Why did WTC 7 collapse, while no other known building in history has collapsed due to fires alone? The collapse of WTC 7 is the first known instance of a tall building brought down primarily by uncontrolled fires. The fires in WTC 7 were similar to those that have occurred in several tall buildings where the automatic sprinklers did not function or were not present. These other buildings, including Philadelphia's One Meridian Plaza, a 38-story skyscraper that burned for 18 hours in 1991, did not collapse due to differences in the design of the structural system. Factors contributing to WTC 7's collapse included: the thermal expansion of building elements such as floor beams and girders, which occurred at temperatures hundreds of degrees below those typically considered in current practice for fire-resistance ratings; significant magnification of thermal expansion effects due to the long-span floors in the building; connections between structural elements that were designed to resist the vertical forces of gravity, not the thermally induced horizontal or lateral loads; and an overall structural system not designed to prevent fire-induced progressive collapse. What are the major differences between "typical" major high rise building fires that have occurred in the United States and the fire in the WTC 7 building on September 11, 2001? There are more similarities than differences between the uncontrolled fires that burned in WTC 7 and those that occurred in the following buildings: First Interstate Bank Building (1988), One Meridian Plaza Building (1981), One New York Plaza (1970), and WTC 51 (2001). The following factors describe the fire events that occurred in both WTC 7 and the referenced buildings: 1) the fuel for the fires was ordinary office combustibles at ordinary combustible load levels; 2) there was no use of accelerants; 3) the spread of fire from combustible to combustible was governed by ordinary fire physics; 4) fire-induced window breakage provided ventilation for continued fire spread and growth; 5) there were simultaneous fires on multiple floors; 6) the fires on each floor occupied a substantial portion of the floor; 7) the fires on each floor had passed the point of flashover and the structure was subjected to typical post-flashover temperatures; 8) the sprinklers were inoperative or ineffective; and 9) the fires burned for sufficient time to cause significant distortion and/or failure to the building structure. There were some differences between the fires in WTC 7 and those in the referenced buildings, but these differences were secondary to the fire factors that led to the collapse of WTC 7: 1) Fires in high rise buildings typically have a single point of origin on a single floor, whereas the fires in WTC 7 likely had a single point of origin on multiple (10) floors; 2); fires in other high rise buildings were due to isolated events, whereas the fires in WTC 7 followed the collapse of WTC 1; 3) water was available to fight fires in the other high rise buildings, but the water supply to fight fires in WTC 7 was impaired; and 4) while the fires in the other buildings were actively fought by fire fighters to the extent possible, in WTC 7, no efforts were made to fight the fires. The differences in the fires were not meaningful for the following reasons. By the time that WTC 7 collapsed, the fires in WTC 7 had advanced well beyond the likely points of origin on multiple floors (i.e., south and west faces) and originating points of fire origin had no bearing on the fire conditions when the building collapsed (i.e., in the northeast quadrant). Additionally, in each of the other referenced buildings, the fires burned out several floors, even with available water and fire fighting activities (except for WTC 5). Thus, whether the fire fighters fought the WTC 7 fires or not is not a meaningful point of dissimilarity from the other cited fires. 1 WTC 5 was a nine-story building with uncontrolled fires that had complete burnout on a number of floors and partial collapse on four floors. WTC 7's collapse, viewed from the exterior (most videos were taken from the north), did appear to fall almost uniformly as a single unit. This occurred because the interior failures that took place did not cause the exterior framing to fail until the final stages of the building collapse. The interior floor framing and columns collapsed downward and pulled away from the exterior frame. There were clues that internal damage was taking place, prior to the downward movement of the exterior frame, such as when the east penthouse fell downward into the building and windows broke out on the north face at the ends of the building core. The symmetric appearance of the downward fall of the WTC 7 was primarily due to the greater stiffness and strength of its exterior frame relative to the interior framing. More robust connections and framing systems to better resist effects of thermal expansion on the structural system. Structural systems expressly designed to prevent progressive collapse. Current model building codes do not require that buildings be designed to resist progressive collapse. Better thermal insulation (i.e., reduced conductivity and/or increased thickness) to limit heating of structural steel and minimize both thermal expansion and weakening effects. Insulation has been used to protect steel strength, but it could be used to maintain a lower temperature in the steel framing to limit thermal expansion. Improved compartmentation in tenant areas to limit the spread of fires. Thermally resistant window assemblies to limit breakage, reduce air supply and retard fire growth. Thermite is a combination of aluminum powder and a metal oxide that releases a tremendous amount of heat when ignited. It is typically used to weld railroad rails together by melting a small quantity of steel and pouring the melted steel into a form between the two rails. To apply thermite to a large steel column, approximately 0.13 lb of thermite would be needed to heat and melt each pound of steel. For a steel column that weighs approximately 1,000 lbs. per foot, at least 100 lbs. of thermite would need to be placed around the column, ignited, and remain in contact with the vertical steel surface as the thermite reaction took place. This is for one column . presumably, more than one column would have been prepared with thermite, if this approach were to be used. It is unlikely that 100 lbs. of thermite, or more, could have been carried into WTC 7 and placed around columns without being detected, either prior to Sept. 11 or during that day. Given the fires that were observed that day, and the demonstrated structural response to the fires, NIST does not believe that thermite was used to fail any columns in WTC 7. In June 2009, NIST began releasing documents in response to a Freedom of Information Act (FOIA) request from the International Center for 9/11 Studies for "all of the photographs and videos collected, reviewed, cited or in any other way used by NIST during its investigation of the World Trade Center building collapses." One of the items released, a video obtained from NBC News , shows World Trade Center Building 7 (WTC 7) in the moments before it collapsed, then cuts to the collapse already in progress, with the building's east penthouse "disappearing" from the scene (as it had already fallen in the intervening time). Other videos of the WTC 7 collapse show the penthouse falling first, followed by the rest of the building. Did NIST edit the NBC News video to remove the collapse of the penthouse? The video footage released under the FOIA request was copied from the original video exactly as it was received from NBC News, with video documentation of the WTC 7 east penthouse collapse missing. The footage was not edited in any way by NIST. Did fuel oil systems in WTC 7 contribute to its collapse? No. The building had three separate emergency power systems, all of which ran on diesel fuel. The worst-case scenarios associated with fires being fed by ruptured fuel lines-or from fuel stored in day tanks on the lower floors-could not have been sustained long enough, could not have generated sufficient heat to weaken critical interior columns, and/or would have produced large amounts of visible smoke from the lower floors, which were not observed. As background information, the three systems contained two 12,000 gallon fuel tanks, and two 6,000 gallon tanks beneath the building's loading docks, and a single 6,000 gallon tank on the 1st floor. In addition one system used a 275 gallon tank on the 5th floor, a 275 gallon tank on the 8th floor, and a 50 gallon tank on the 9th floor. Another system used a 275 gallon day tank on the 7th floor. Several months after the WTC 7 collapse, a contractor recovered an estimated 23,000 gallons of fuel from these tanks. NIST estimated that the unaccounted fuel totaled 1,000 ±1,000 gallons of fuel (in other words, somewhere between 0 and 2,000 gallons, with 1,000 gallons the most likely figure). The fate of the fuel in the day tanks was unknown, so NIST assumed the worst-case scenario, namely that they were full on Sept. 11, 2001. The fate of the fuel of two 6,000 gallon tanks was also unknown. Therefore, NIST also assumed the worst-case scenario for these tanks, namely that all of the fuel would have been available to feed fires either at ground level or on the 5th floor. Why did NIST model the sprayed fire resistive material (SFRM, also referred to as fireproofing) on the WTC 7 beams and columns as a "perfect" installation (i.e., without any gaps or damage in the SFRM coating), when realistically most buildings have some gaps or damage in the SFRM coating, either due to improper installation or deterioration over time? NIST carefully considered the condition of the SFRM installation in WTC 7, including the applied thickness and evidence of gaps or damage in the SFRM. The SFRM in WTC 7 was modeled as undamaged except in the southwest region of the building where there was debris impact damage2. A uniform thickness equal to the specified SFRM thickness was used for the finite element thermal analyses of WTC 7 because 1) the variability in the SFRM thickness was small, 2) no evidence of significant damage to the SFRM was found, and 3) small areas of SFRM damage would not have affected the thermal or structural response of the structural framing system. Why did the investigation take so long to complete? The overall NIST investigation began on Aug. 21, 2002. Early in the investigation, a decision was made to complete studies of the two tower collapses (WTC 1 and WTC 2) before fully proceeding on the WTC 7 investigation. A major technical conference on the draft reports on WTC 1 and WTC 2 occurred on Sept. 13-15, 2005. The time between the technical conference on the WTC towers report and the issuance of this draft WTC 7 report is approximately three years, comparable to the length of a typical investigation of an aircraft crash. The WTC 7 investigation was an extensive, state-of-the-art reconstruction of the events that affected WTC 7 and eventually led to its collapse. Numerous facts and data were obtained, then combined with validated computer modeling that is believed to be close to what actually occurred. A single computer simulation of the structural response to fires took about eight months to complete on powerful computing workstations and clusters. Would WTC 7 have collapsed even if there had been no structural damage induced by the collapse of the WTC towers? Yes. Even without the structural damage, WTC 7 would have collapsed from the fires that the debris initiated. The growth and spread of the lower-floor fires due to the loss of water supply to the sprinklers from the city mains was enough to initiate the collapse of the entire building due to buckling of a critical column in the northeast region of the building. Why did WTC 7's sprinkler systems fail during the fires? The sprinkler systems did not fail. The collapse of WTC 1 and WTC 2 damaged the city water main. The water main served as both the primary and backup source of water for the sprinkler system in the lower 20 floors. Therefore, the sprinkler system could not function. In contrast, the sprinklers and standpipes on the building's middle levels (21st floor through 39th floor) and upper levels (40th floor through 47th floor) received water from two large overhead storage tanks on the 46th floor, and used the city's water mains as a backup. Did the electrical substation next to WTC 7 play a role in the fires or collapse? No. There is no evidence that the electric substation contributed to the fires in WTC 7. The electrical substation continued working until 4:33 p.m. on Sept. 11, 2001. Alarms at the substation were monitored, and there were no signals except for one event early in the day. No smoke was observed emanating from the substation. Special elements of the building's construction-namely trusses, girders, and cantilever overhangs, which were used to transfer loads from the building superstructure to the columns of the electric substation (over which WTC 7 was constructed) and foundation below-also did not play a significant role in the collapse. Why were there no fatalities from the collapse of WTC 7? Several factors contributed to the outcome of no loss of life-or serious injuries-in WTC 7. The building had only half the number of occupants on a typical day-with approximately 4,000 occupants-at the times the airplanes struck the towers. Occupants had recently participated in fire drills. The occupants, alerted by the attacks on WTC 1, WTC 2, and the Pentagon, began evacuating promptly. Evacuation of the building took just over an hour, and the process was complete before the collapse of the first WTC tower (WTC 2). Emergency responders provided evacuation assistance to occupants. No emergency responders were harmed in the collapse of WTC 7 because the decision to abandon all efforts to save WTC 7 was made nearly three hours before the building fell. Why didn't the investigators look at actual steel samples from WTC 7? Steel samples were removed from the site before the NIST investigation began. In the immediate aftermath of Sept. 11, debris was removed rapidly from the site to aid in recovery efforts and facilitate emergency responders' efforts to work around the site. Once it was removed from the scene, the steel from WTC 7 could not be clearly identified. Unlike the pieces of steel from WTC 1 and WTC 2, which were painted red and contained distinguishing markings, WTC 7 steel did not contain such identifying characteristics. Your entire investigation included no physical evidence. How can you be so sure you know what happened? In general, much less evidence existed for WTC 7 than for the two WTC towers. The steel for WTC 1 and WTC 2 contained distinguishing characteristics that enabled it to be identified once removed from the site during recovery efforts. However, the same was not true for the WTC 7 steel. Certainly, there is a lot less visual and audio evidence of the WTC 7 collapse compared to the collapses of the WTC 1 and WTC 2 towers, which were much more widely photographed. Nonetheless, the NIST investigation of WTC 7 is based on a huge amount of data. These data come from extensive research, interviews, and studies of the building, including audio and video recordings of the collapse. Rigorous, state-of-the-art computer methods were designed to study and model the building's collapse. These validated computer models produced a collapse sequence that was confirmed by observations of what actually occurred. In addition to using its in-house expertise, NIST relied upon private sector technical experts; accumulated copious documents, photographs and videos of this disaster; conducted first-person interviews of building occupants and emergency responders; analyzed the evacuation and emergency response operations in and around WTC 7; performed computer simulations of the behavior of WTC 7 on Sept. 11, 2001, and combined the knowledge gained into a probable collapse sequence. Did WTC 7 conform to building and fire codes? The team found that the design of WTC 7 in the 1980s was generally consistent with the New York City building code in effect at that time. WTC 7's designers intended its stairwells to evacuate nearly 14,000 occupants, anticipated at the time to be the maximum occupancy of the building. Though the stairwell's capacity was overestimated, it was adequate for evacuating the building's actual maximum occupancy of 8,000, and more than adequate to evacuate the approximately 4,000 occupants who were in the building on Sept. 11.
composite floor systems whose shear studs could fail due to differential thermal expansion (i.e., heat-induced expansion of material at different rates in different directions). Typical floor span lengths in tall office buildings are in the range of 40 ft. to 50 ft. This range is considered to represent long span floor systems. Thermal effects (e.g., thermal expansion) that may be significant in long-span buildings may also be present in buildings with shorter span lengths depending on the design of the structural system. The earlier recommendations encompass increasing structural integrity of buildings, enhancing structures' endurance when exposed to fire, creating new methods for increasing fire resistance in structures, improving active fire protection, improving some aspects of emergency response, and increasing education and training. What are some of the firsts in this investigation? This investigation is the first to show how fire can cause progressive collapse in a building. It is also the first to show that under certain conditions thermal expansion effects-rather than loss of strength and stiffness due to fire-can lead to structural collapse. It is the first to analyze a building's response behavior and determine its collapse sequence by integrating detailed models/simulations of debris impact damage, fire growth and spread, thermal analysis, collapse initiation, and collapse propagation-up to global collapse. This was an analysis of unprecedented complexity-an end-to-end computer run for the WTC towers on some powerful computers took about two months while a similar run for WTC 7 took about eight months, or about four times as long. NIST expects that the tools developed from this investigation, as well as the knowledge obtained from it, will aid in the development of more robust building design practice and in studies of future building collapse processes. These expanded tools and derived, validated, and simplified analysis approaches can guide practitioners and prevent future disasters. Why did NIST study the collapse of WTC 7? The NIST investigation of WTC 7 was conducted under the National Construction Safety Team (NCST) Act, as part of its overall building and fire safety investigation of the World Trade Center disaster. The act gives NIST the responsibility for conducting fact-finding investigations of building failures that resulted in substantial loss of life or that posed significant potential of substantial loss of life. NIST has no regulatory authority under the NCST Act. How does the final report on WTC 7 issued on Nov. 23, 2008, differ from the draft report that was released for public comment on Aug. 21, 2008? The final report is strengthened by clarifications and supplemental text suggested by organizations and individuals worldwide in response to the draft WTC 7 report, but the revisions did not alter the investigation team's major findings and recommendations, which include identification of fire as the primary cause for the building's failure. Have the recommendations from NIST's investigation of the WTC towers led to any changes in building codes, standards, and practices? The first comprehensive set of eight model building code changes based on recommendations from NIST's investigation of the WTC towers were adopted by the International Building Code in 2007. A second set of eight model building code changes based on NIST's recommendations from its investigation of the WTC towers were approved by technical committees and are awaiting approval, along with potential appeals on several other code changes, at the Final Action Hearing for the 2009 edition of the International Building Code. NIST's recommendations from its investigation of the WTC towers also have spurred actions to develop new provisions/guidelines within other standards, codes, and industry organizations, such as: the National Fire Protection Association, the American Society of Mechanical Engineers, ASTM International, the American Society of Civil Engineers, and the Council on Tall Buildings and Urban Habitat. What specific code changes based on recommendations from NIST's investigation of the WTC towers have been approved for inclusion in the International Building Code? 1. An additional exit stairway for buildings more than 420 feet in height. 2. A minimum of one fire service access elevator for buildings more than 120 feet in height. 3. Increased bond strength for fireproofing (nearly three times greater than currently required for buildings 75-420 feet in height and seven times greater for buildings more than 420 feet in height). the finished condition of the installed fireproofing, upon complete drying or curing, does not exhibit cracks, voids, spalls, delamination or any exposure of the substrate. 5. Special field inspections of fireproofing to ensure that its as-installed thickness, density and bond strength meet specified requirements, and that a bonding agent is applied when the bond strength is less than required due to the effect of a primed, painted or encapsulated steel surface. The inspections are to be performed after the rough installation of mechanical, electrical, plumbing, sprinkler and ceiling systems. 7. Explicit adoption of the "structural frame" approach to fire resistance ratings that requires all members of the primary structural frame to have the higher fire resistance rating commonly required for columns. The primary structural frame includes the columns, other structural members including the girders, beams, trusses, and spandrels having direct connections to the columns, and bracing members designed to carry gravity loads. 8. Luminous markings delineating the exit path (including vertical exit enclosures and passageways) in buildings more than 75 feet in height to facilitate rapid egress and full building evacuation.